Anxiety and stress are a part of everyday life. While a certain level of anxiety is normal, excessive levels of anxiety can cause physical problems like high blood pressure and insomnia and lead to the development of anxiety disorders. Certain nutritional supplements, like biotin, may help combat the effects of excessive stress and anxiety. Consult your doctor before using any nutritional supplements. Although it's also referred to as vitamin H, biotin is actually a member of the family of B-complex vitamins. As with all B-complex vitamins, biotin plays an important role in energy metabolism and helps to maintain normal cell growth and development. It also assists nervous system functioning. According to the University of Maryland Medical Center, biotin deficiencies are rare but can cause serious symptoms such as hair loss, skin problems, fatigue, insomnia and depression. Biotin is naturally available in foods such as egg yolks, sardines, nuts, cauliflower and mushrooms. Anxiety is the physical and emotional result of your body's natural "fight-or-flight" response to fearful or stressful situations. However, if you experience persistent anxiety when no fearful or stressful situation is present, you may be suffering from an anxiety disorder. Anxiety disorders can cause a severe impact on your ability to function in everyday life. Symptoms of anxiety disorders include intense fear, panic, irritability, sweating, trembling, tension, excessive worry, nervousness, sleep disturbances, appetite changes and unexplained aches and pains. While anxiety disorders are generally treated with psychotherapy and/or anti-anxiety medications, some people prefer to use natural, holistic remedies, such as dietary supplements. Biotin may help with anxiety symptoms, although there's very little scientific evidence to support this claim. In his book, "The Anxiety & Phobia Workbook," psychologist Edmund J. Bourne states that deficiencies of the B vitamins, including biotin, can lead to increased feelings of anxiety, irritability and emotional instability. In fact, a literature review published in the January/February 2007 issue of the "Journal of International Medical Research," points out the importance of all of the B vitamins for cognitive performance, especially if you have a stressful lifestyle, are elderly or experience occupational pressure. However, a review published in the October 2004 issue of the "Medical Journal of Australia" points out that while biotin supplements are commonly used to treat anxiety, no clinical research supports the claim that it actually works. More scientific studies are necessary to confirm the benefits of biotin supplementation for symptoms of anxiety. 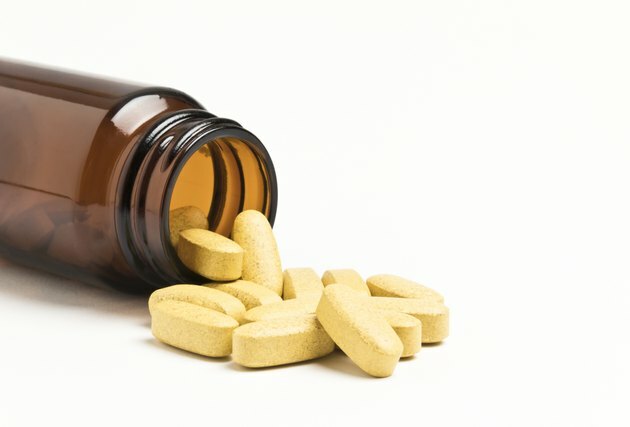 While anecdotal evidence suggests that biotin supplements may help anxiety, you should not use any dietary supplement to self-treat your symptoms. Anxiety disorders can worsen if not properly treated. Consult your doctor or a qualified mental health professional if you think you may be suffering from an anxiety disorder. According to the University of Maryland Medical Center, biotin is not associated with any negative side effects and does not appear to interact with any medication. However, you should inform your doctor before using any dietary supplement, including biotin.